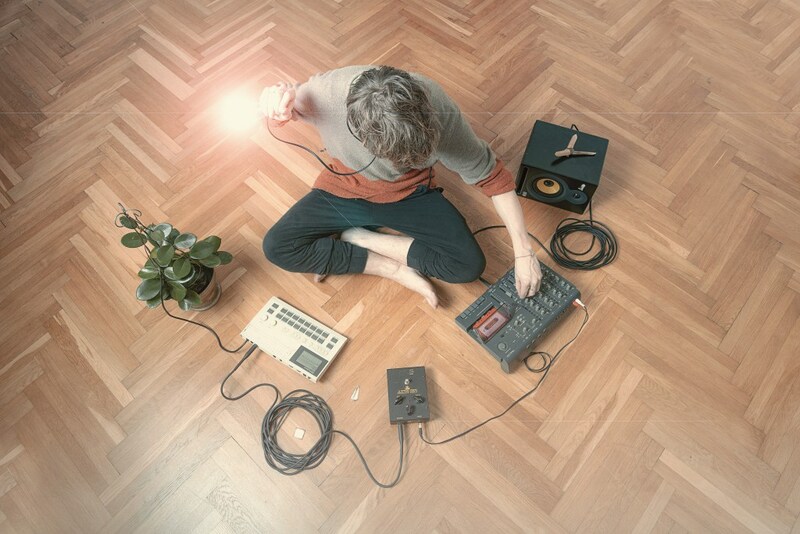 ticktock is otherwise known as Sebastian Zieler and his otherworldly pop is unique to say the least. His synth-band-dance-pop, TCOLT EP is out now on The Big Oil Recording Company. The simple rolling beats and deceptively catchy melody of debut single 'A- A- A-' move round and through layers of synths. The DIY nature of recordings does nothing but emphasise the raw magnetism of his song writing. The instrumentation is where the genres blend, with a beautiful use of every nuance. ticktock's music is, at the very least, thoughtful, but at the very most it's hypnotic. ticktock: I'm pretty excited about music in Denmark and have been for years. Considering there are only 5 million people living here, the musical output of this place is almost suspiciously large, eclectic and interesting. As far as I can tell, the DIY scene surrounding the venue Mayhem in Copenhagen has gotten the most attention internationally (especially the bands Iceage and Lower), but Danish music is a pretty multifaceted thing: Personally I'm mainly drawn to the aforementioned grittier, DIY side of things (with labels like Escho, BadstueRock and Shordwood) and to the both visceral and dream-like electronic music of artists Aebeloe and Taragana Pyjarama, to name a couple. There's a mass of great independent labels - Infinite Waves for a wonderfully curated selection of niche releases ranging from ambient to noise to rock and folk. Tambourhinoceros - look out for their new signing Palace Winter and their track Woke In The Night! Copenhagen Underground Posse for deep, undulating beats and Crunchy Frog for their uncompromising playfulness (check out Snake & Jet's Amazing Bullit Band's Peace Boat right now!) to name but a few! And to shamelessly self-promote, I also co-run The Big Oil Recording Company -- or Big Oil for short -- and am in love with the music we're lucky enough to put out. Both Battle and LESS WIN have records coming out this year, and they're some of my very favourites this side of the North Sea. Looking forward to sharing both! To round things off on my Copenhagen music tirade, there's a nice feeling of working together in this place. The people behind the bands, labels and venues are doing it because they love it and you can really tell. Iggy Pop & The Stooges - 'Search & Destroy'. It's like thrusting your way from this life to the next in 3.31 stupid, glorious minutes. Recondite and his track 'Levo'. It sounds like machines dreaming up forests. Pix. Her voice sounds like it explores something very deep in a playful way - like it's a joy to sing even at its most moving. Her track 'A Way To Say Goodbye' has soundtracked the last couple of months for me - everything from the most mundane to the most fun to the most serene: rainy walks to my rehearsal space, a New Year's Party that escalated and/ or descended into naked dancing (pardon the TMI, Pix) and a bus journey to the coast of Kerala through mad traffic and jungle in the diffuse and dusty light at sunrise. Can't wait to hear more from her. Right now, I'm trying make friends with my calendar, but we don't have a good history together. Lately I've been much too busy with way too many things. It's a stupid habit and I'm trying to break it. If I don't keep it in check, it's like my calendar has a life of its own - a temporally ambitious monster filling every possible hour with stuff that needs doing with no regard for important everyday things like eating and sleeping and staring into space. I'm trying to spend more time eating, sleeping and staring into space. So far so good: I just ate. And earlier, I slept. Staring into space, however, is risky business in my locale: the space immediately opposite my window is occupied by a magnificently colourful and inviting discount pick'n'mix sweetshop and my tastebuds are immature, weak synthetic-flavour-junkie-things. In the immediate future, a new single and music video made with photographer Rune Rogren. After our London release show at the Old Blue Last 19/03/15, I'm making a booklet that sort of goes hand in hand with the EP. And then working with the live band to finish a new collection of songs.